Rammstein’s Paul Landers: "I’ve always been the no-amp guy! I have never really bothered with them"
There is no other band in the world quite like Rammstein. The German sextet have become pioneers of industrial metal, bringers of epic I-can’t-believe-they-just-did-that stage shows and undisputed masters of provocative imagery, to the point where no other bands ever get to follow their fire-kissed headline performances. And nor would they want to. 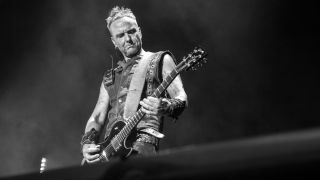 Alongside Richard Z. Kruspe, Paul Landers has been one half of their guitar unit from the off. This year sees the release of his PL1 Fly Rig, made by Tech 21 - the culmination of two years of fine-tuning in search of a product worthy of conquering stadiums the world over. Speaking exclusively to MusicRadar, he admits that - unlike his co-guitarist - there are no amps or mics seen on his side of the stage. Instead, it’s all about going as direct as humanly possible. When did you start working on this with Tech 21? What do you think makes it different to the Brit, Cali or Richie Kotzen models already out there? “There is a different engine inside it; in fact, there are two independent engines in there: one for the Feuer [dirty] sound and the other for the Wasser [clean] sound. How does that fit into the band’s overall sound? “Obviously in Rammstein there are two guitarists - the other guy [Richard Kruspe] was always the amp guy and I’ve always been the no-amp guy! I have never really bothered with them… whether it’s because they don’t like me or the other way round, haha! “Sonically, we as a band have always preferred that mix of amps, with one a bit more ‘live’ and the other a bit more direct. That is the recipe for the Rammstein guitar sound. “For years, I had the PSA1 and then over the last few years I’ve been using the SansAmp GT2. So with the PL1 we tried to rebuild my main sound from the GT2 with the Roland included, so I can use it for everything straight out of the box. There’s a built-in tuner and an XLR out, so I can go straight into the console for usage live in any stadium and arena we play! Tell us more about the delay section. What kind of pedals influenced that element of the PL1? “I really like the MXR Carbon Copy Deluxe, which is a lovely analogue delay that is similar to the Electro-Harmonix Memory Man, which is actually my favourite, but it has a limited delay time and is too big. When MXR came out with the Carbon Copy models, I found them to be the best for me to use in whatever situation, in any venue. Have you ever experimented with the more high-powered digital units? “For a while I was using emulation boxes and I absolutely hated fiddling around with all the menus. I’m so glad I have this now: I can just hit a knob and immediately have everything I need. I don’t like presets - in fact, I hate presets… if I want something I like to find it myself there and then. “Exactly! It really can do anything I need. For example, if I go somewhere with my laptop, I don’t need anything else for recording my ideas. Maybe I might take a phaser, but that’s really about it. Speaking of working on music… how’s the new Rammstein material coming along? “Right now, it looks like this new record will be coming out next spring, and what we’ve been mainly doing is playing together in a circle, with all the guys in one room. We all go into the mixing desk and I had my PL1 prototype going direct. Same for the some of the other guys - our drummer [Christoph Schneider] has these electronic drums, so we’ve been using that to play a bunch of ideas together. The Paul Landers PL1 Signature Fly Rig is available soon for $329/€399/£359. Head over to Tech 21 for more info.